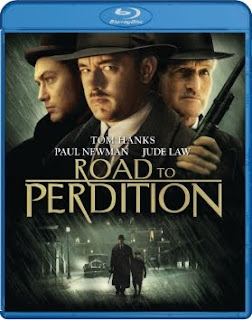 Home » Home Entertainment » ROAD TO PERDITION comes to Blu-ray in August. ROAD TO PERDITION comes to Blu-ray in August. The film version of Max Allen Collin’s fantastic ROAD TO PERDITION goes high def on August 3rd, when Paramount releases it on Blu-ray. Two-time Academy Award® winner Tom Hanks in “one of his best performances” (Kenneth Turan, Los Angeles Times) stars as Michael Sullivan, a father fighting to keep his only son from traveling the Road to Perdition. Directed by Oscar® winner Sam Mendes (American Beauty), this towering motion picture achievement has been acclaimed by audiences and critics alike. Also starring Academy Award® winner Paul Newman and Oscar® nominee Jude law, Road to Perdition weaves a mesmerizing tale of a father and son bound together by tragedy and betrayal. On an unforgettable journey of honor, vengeance and redemption, they confront overwhelming odds – and forge an indestructible bond. Hailed for the powerhouse performances of its stars and the stunning impact of its story, Road to Perdition is an electrifying experience that will stay with you for a lifetime. Rating: R – For violence and language.